Good morning and welcome to another 48 Hour Flash Sale! This sale is for 48 hours ONLY and will end on Sunday, April 1, 2018, at 7 AM PST. 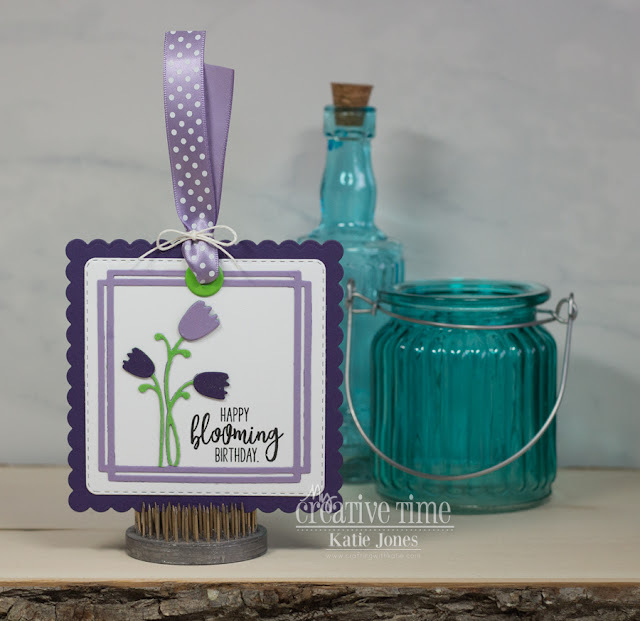 Today we are showcasing an AMAZING new die and coordinating stamp set! They are Cute Flower Tag Die and Mini Spring Greetings. These two are available for purchase now! Don't forget to use the code FLASH at checkout to get 20% off your entire in-stock only purchase! I love all of the tags in the cute tag collection, and the Cute Flower Tag is no exception! 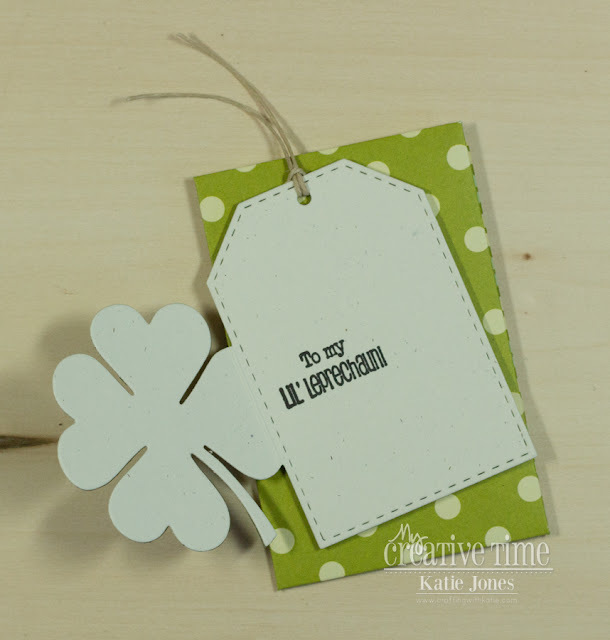 They are all so easy to use to make a quick and adorable tag! For this one, I used some fun tie-dye paper that I had in my stash, along with a big button for the center of my flower! 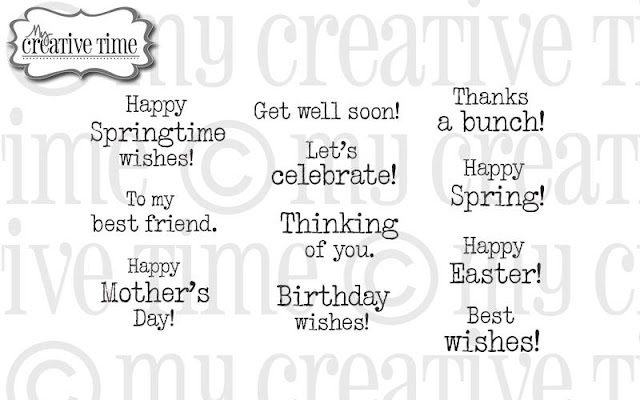 The Mini Spring Greetings set has 11 adorable little sentiments, and the birthday one was perfect for this tag! 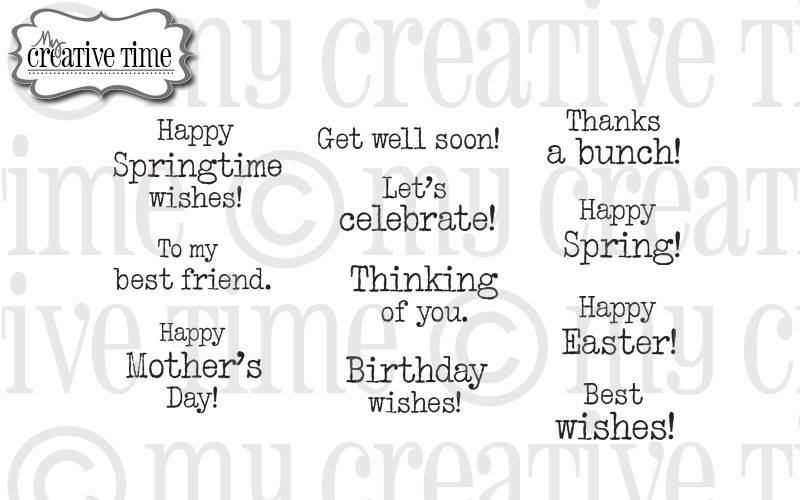 I always love using little sentiments on tags and cards, so I'm happy to have added more to my collection! 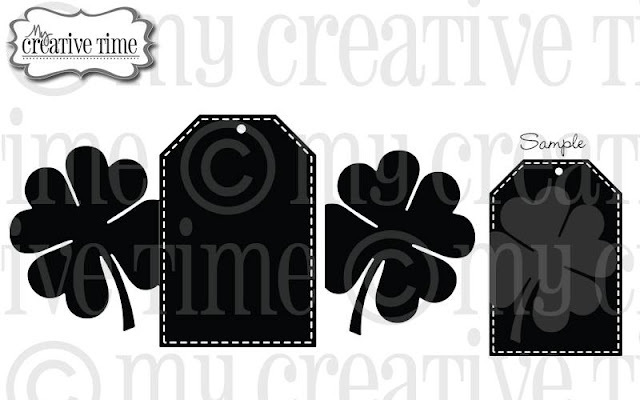 Leave your comments for a chance to win a $25 Gift Card to the "My Creative Time" store! Don't forget to leave a way for us to contact you "just in case" YOU are the LUCKY winner! Good Luck! 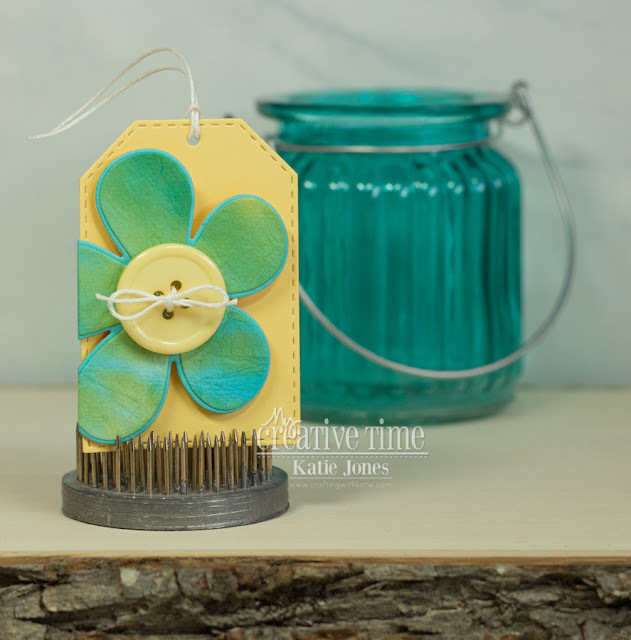 Come hop along with us for LOTS of inspiration using these 2 items! It's Thoughtful Tuesday with My Creative Time, and the new Springtime Smiles stamp set has the perfect sentiments for making a "just because" card. I chose a sweet sentiment and paired it with the new Daisy Frame Die. I cut the frame three times, in white, green, and turquoise, trimming and piecing it together to get the fun two-toned look with the white daisies. As a final touch, I added some sweet little butterflies made with the Mini Butterfly Dies. Be sure to stop by Emma's blog for more Thoughtful Tuesday inspiration! It's Whatever Wednesday with My Creative Time! Today I have put together a special card for my nephew. For his birthday, my son is going to take him out for dinner and a movie. My son is 22 and my nephew is 12, so it's fun for him to do an activity with his big cousin. 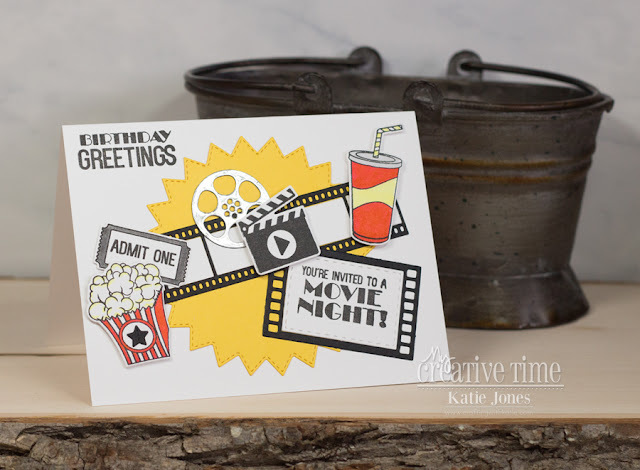 The Date Night stamp and die set was perfect for making this card! I just love all of the fun little elements on it. The only two things on here not from this set are the teeny star on the popcorn bucket, which is from the 4x4 Journal Die + More set, and the starburst, which I made with one of the Stitched Starburst Dies. I colored the stamped pieces with my Zig Clean Color Real Brush Pens. Be sure to stop by Emma's blog for more Whatever Wednesday inspiration! I have so many little gymnasts in my class this year! I made this card for one of their birthdays last week, using I cut I found in the Silhouette Design Store. For the background, I used one of My Creative Time's Stitched Rectangular Frame Dies. The "birthday" die cut was made with the Papertrey Ink Wonderful Words: Birthday die, and I inked it up with Tim Holtz Distress Inks in Salty Ocean, Tumbled Glass, and Twisted Citron. "Happy" is from PTI's Stylish Sentiments: Birthday. I finished off the card with some Simon Says Stamp Moonshine Confetti. 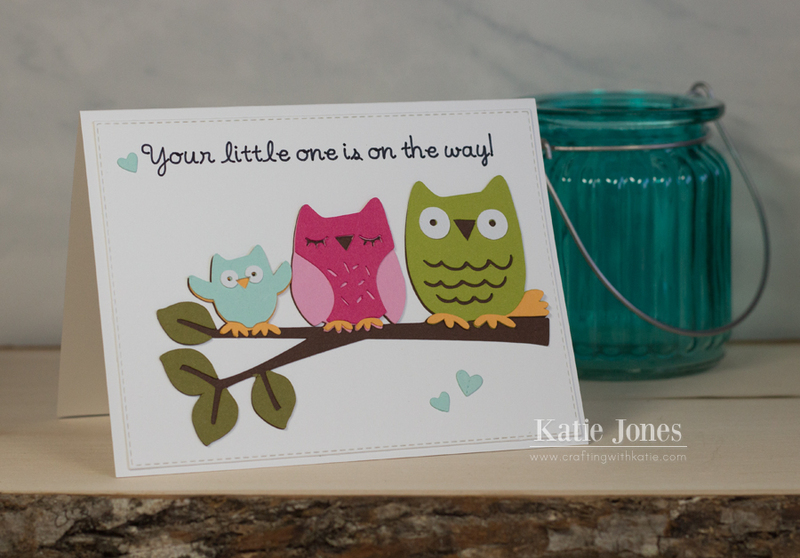 MCT 77th Edition Release & Blog Hop! 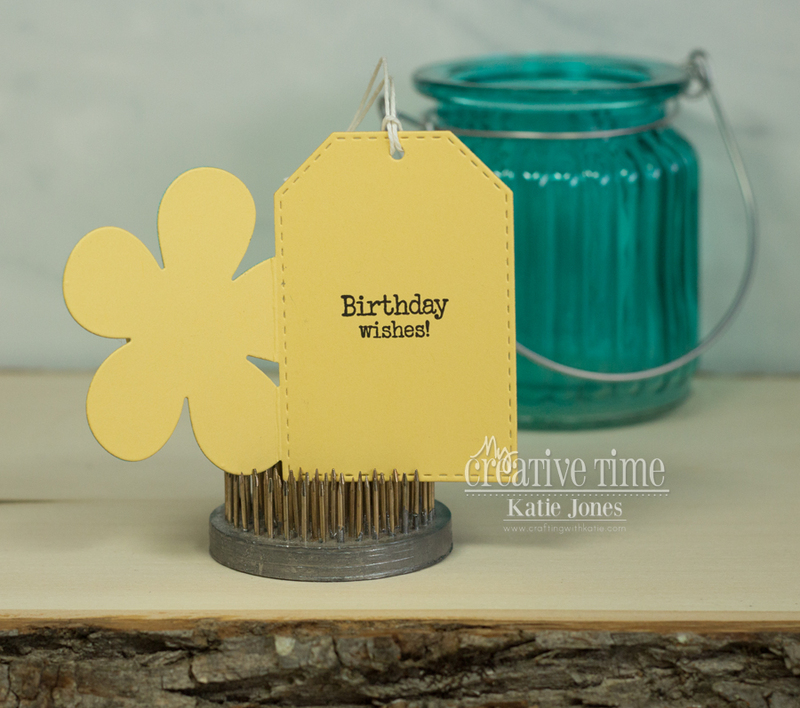 Welcome to the My Creative Time 77th Edition Release Blog Hop! You should have arrived here from the very talented Jessica. If you just happened upon here, you might want to head over to Emma's blog, to the beginning of the hop. This is a very fun release, and I hope you are as excited about it as we are! As soon as I saw these new sets, I knew I wanted to use them to make a card for my mom's birthday! I decided to die cut the Tulip Frame Die out of Strathmore Watercolor cardstock, and then I used my Zig Clean Color Real Brush Pens to watercolor it. After die cutting the frame die again out of a square made with one of the Stitched Square Dies Inside & Out, I nestled the watercolored piece inside of that cut. To give it a little more dimension, I die cut the separate tulip flowers that are included in this set and added them on top. 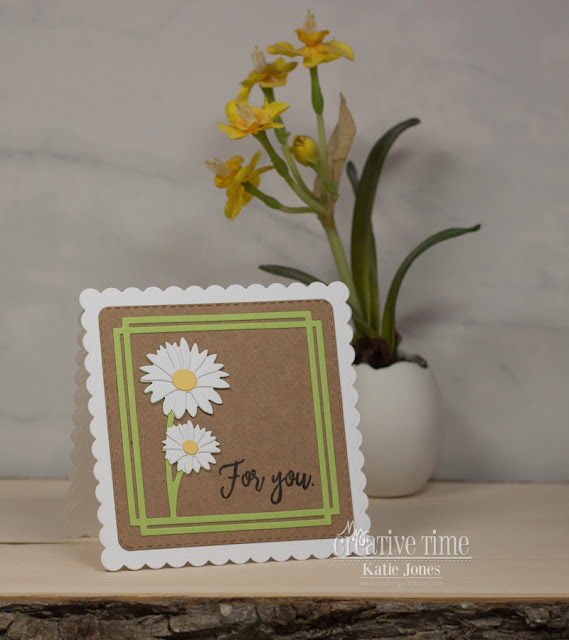 I added a sentiment from Springtime Smiles, a few Papertrey Ink Rainstones, and that was it! So easy, but that frame die really packs a punch! 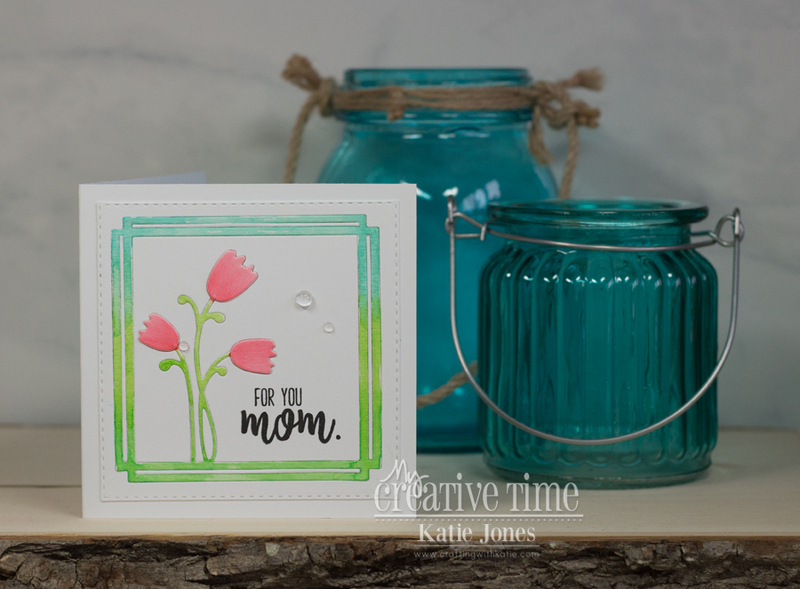 Here's a closer look at Tulip Frame Die and Springtime Smiles. They are available now in the My Creative Time Store! 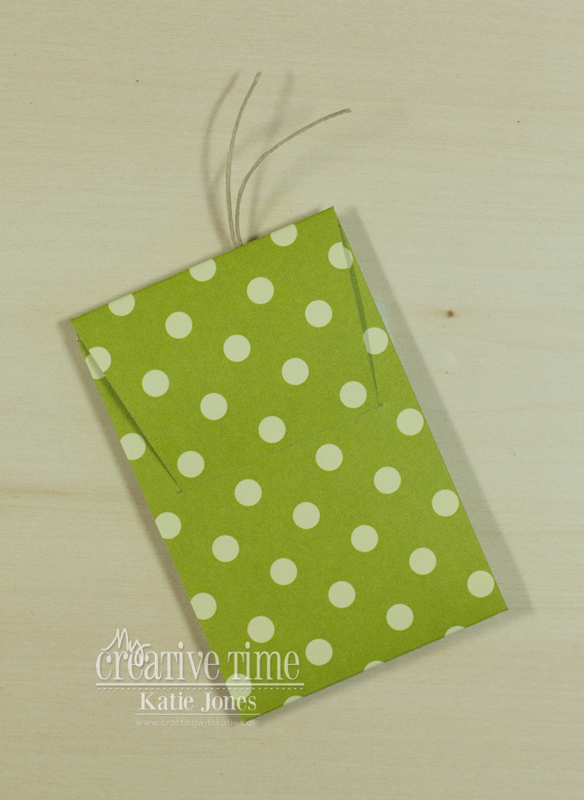 For our blog hop giveaway, Emma is giving away a $50 gift card to the "My Creative Time Store" to one LUCKY winner! All you have to do is leave your comments on our blogs! You are NOT required to comment on ALL blogs, but the more you comment on, the better chances you have for winning! Very important, please leave a way for us to contact you with your comment, just in case you are the lucky winner! Also, DON'T FORGET our sale that is starting RIGHT NOW here! Use the code MAR2018 to receive a discount off your entire purchase! This sale applies to "IN-STOCK" items ONLY. This sale will end on Friday, March 23, 2018 at midnight PST. Your next stop is the incredibly talented Kendra! It's our last say of sneak peeks for the My Creative Time 77th Edition Release! You can get your hands on these sweet goodies tomorrow! 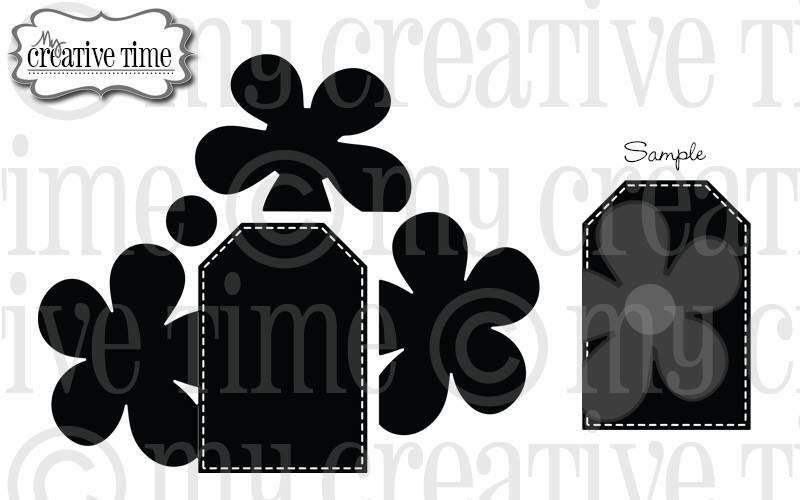 Today we are sneaking another adorable die set: Daisy Frame Die. I'm just loving the new frame dies!!! I die cut this one twice, once in green and once in white, so that I could trim off the white flowers and mount them on top of the green layer. 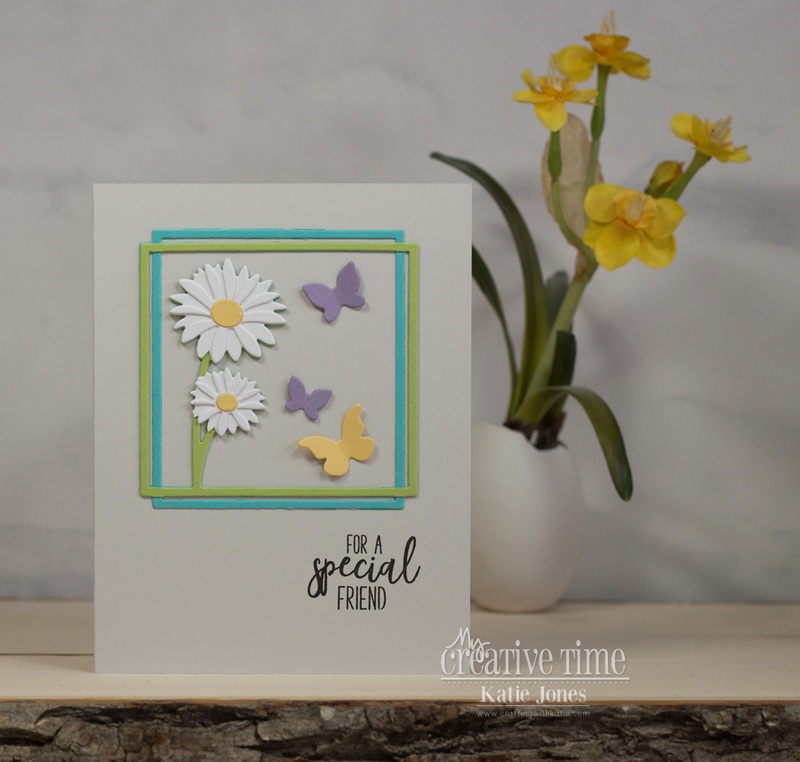 This die set comes with a second layer of the daisy (also cut in white), which gives it some nice diemsion, along with the ovals for the centers, which I die cut in yellow. I love how the whole thing looks on my kraft and white card base, which I made with the Scalloped Stitched Square Dies. The sentiment is from the new Springtime Smiles set. It's day 1 of My Creative Time's 77th Edition Sneak Peeks! We have quite an adorable release to share with you this week! First off are two sets: Tulip Frame Die, the sweetest set of dies ever, and Springtime Smiles, an extremely versatile set of sentiments, perfect for this time of year! I decided to use these fabulous new sets to make a pretty tag today! I used the Scalloped Stitched Square Dies for my base and then added the gorgeous Tulip Frame on top of it. 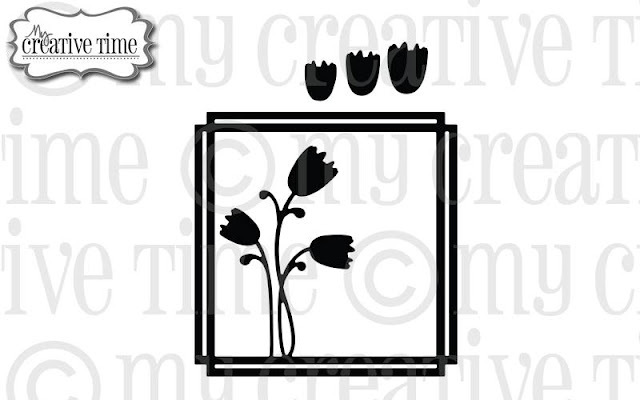 This die set contains the frame with the tulip plants attached, along with the three individual tulip flowers. I cut the frame piece twice, once in green and once in lavender, so I could trim off the green stems and layer them on top of the lavender piece. I then added the tulips, which I had die cut in lavender and purple and gone over with my Wink of Stella pen. The gorgeous sentiment is from Springtime Smiles. I finished off the tag with an eyelet from We R Memory Keepers and some pretty Papertrey Ink Winter Wisteria Swiss Dot Satin Ribbon. 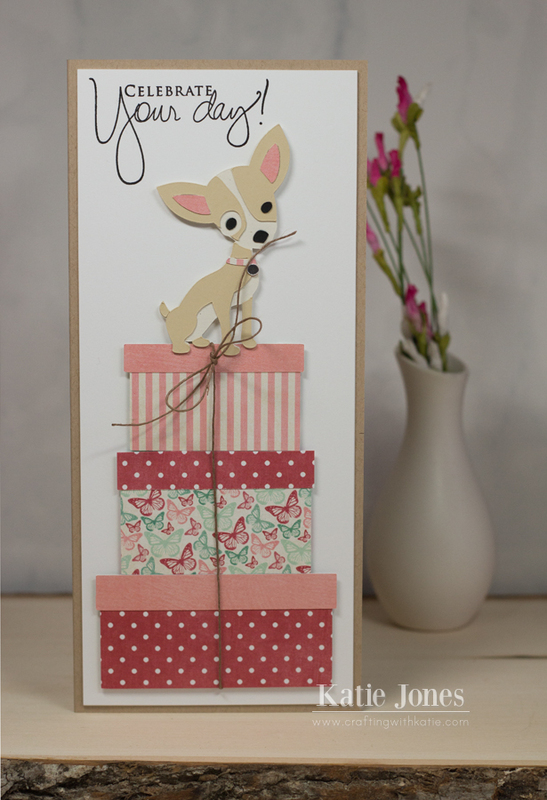 I had fun making this birthday card for a friend who has the cutest chihuahua that is her baby. I used my Cricut Maker to cut the presents (I just created rectangles in Design Space) out of some older Teresa Collins patterned paper I had in my stash. The chihuahua is from the Cricut Four Legged Friends cartridge. I thought it would be cute to adhere the twine from the bow to his mouth so it would look like he was pulling it apart. I made this a 4" x 9" card to accommodate the stacked presents. Finally, I stamped a sentiment from Papertrey Ink's Signature Greetings stamp set. It's 3D Wednesday with My Creative Time! 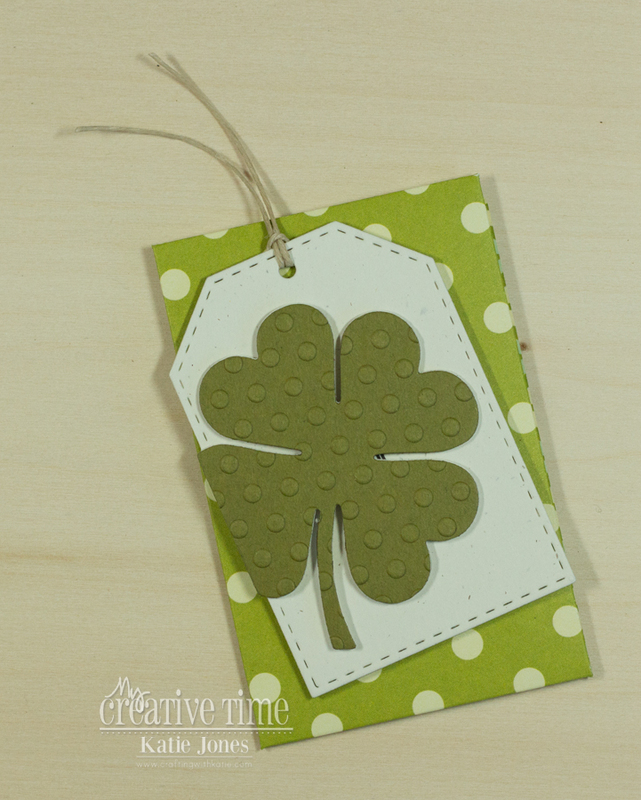 With St. Patrick's Day coming up next week, I knew it was the perfect time to pull out the new 4 Leaf Clover Tag Die. I just love this die; it's another fantastic addition to the MCT Tag Die collection! 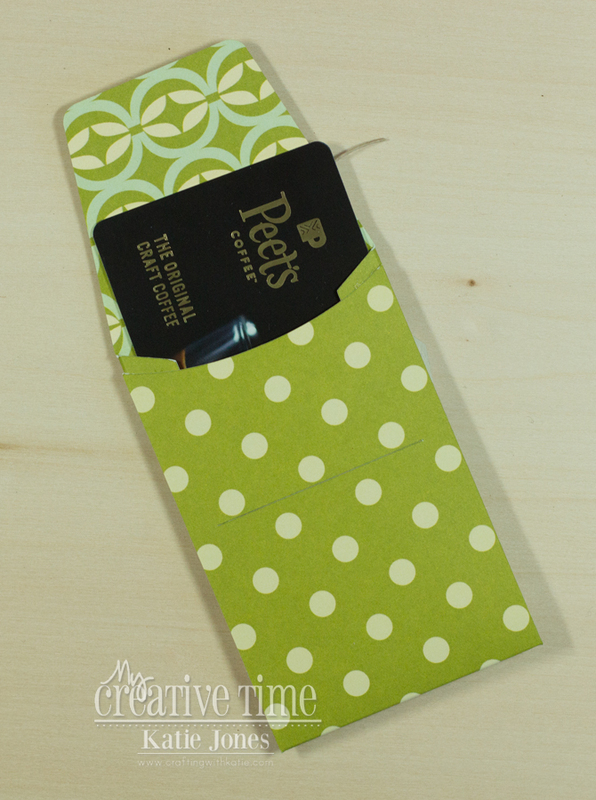 I used some dimensional adhesive to adhere my tag to a simple gift card holder that I cut out with my Cricut Maker. I'm not sure where I got this cut; it's one I had uploaded some time ago. On the inside of the tag I stamped a sweet sentiment from the Teeny Tag Holidays stamp set. Be sure to stop by Emma's blog for some more 3D inspiration! MCT 48 Hour Flash Sale! Good morning & welcome to another "48 Hour Flash Sale!" This sale is for 48 hours ONLY that is going on right NOW & will end on Sunday, March 4, 2018 @ 7am PST. We have an AMAZING new die that Miss Emma is showcasing on her blog!! 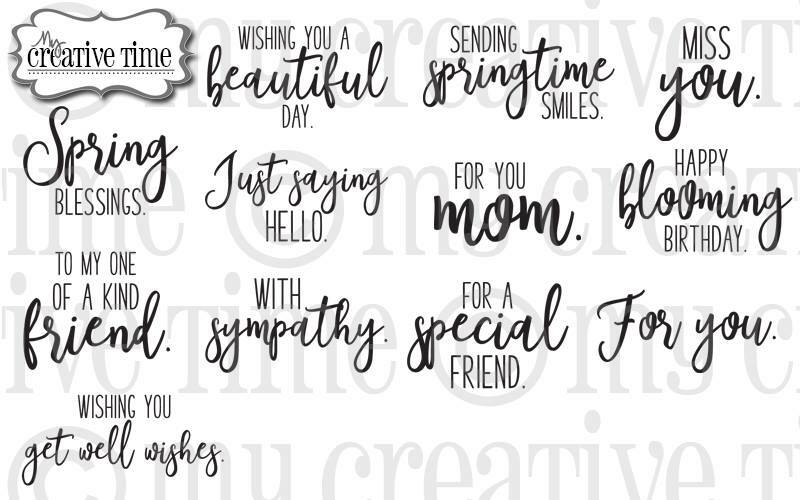 Go here to see more: http://www.creativetimeforme.com/2018/03/48-hour-flash-sale.html Don't forget to use the code FLASH at checkout to get 20% off of your entire "in-stock" only purchase! Leave your comments for a chance to win a $25.00 Gift Card to the "My Creative Time" store! Don't forget to leave a way for us to contact you "just in case" YOU are the LUCKY winner! Good Luck! One of my friends just announced her pregnancy, and I couldn't wait to make her a card! I made this with my Cricut Maker. I didn't have just the right stamp in my collection, so I just found a font that I liked (from the Baby Steps cartridge) and had the marker on the Maker write it out for me! The cute owl die cut is from the Hoot 'n' Holler cartridge. I die cut the background using one of the My Creative Time Stitched Rectangular Frame Dies and added a few hearts made with the MCT 4x4 Journal Dies + More.